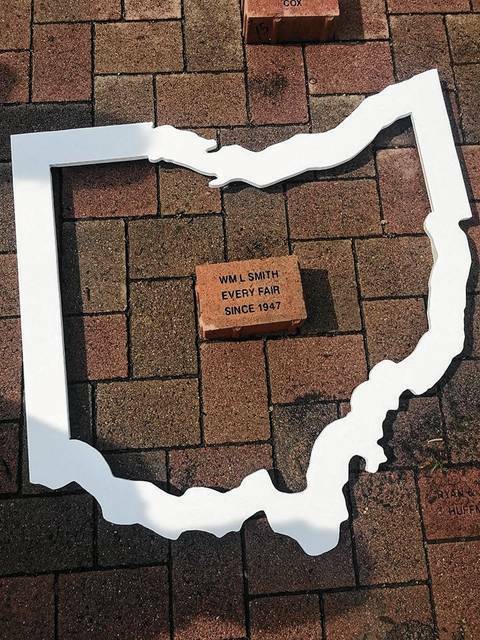 This photo shows William Smith’s honorary brick, a part of the Ohio State Fair Brick Program at the Ohio State Expo Center in Columbus. William Smith of West Liberty is looking forward to his 71st consecutive Ohio State Fair. On June 5, his family dedicated an honorary brick for him at the Ohio State Expo Center in Columbus. WEST LIBERTY – William “Bill” Smith of West Liberty will be attending his 71st consecutive Ohio State Fair this summer. The 80-year-old first attended the fair in 1938, but he has been visiting the fair every year without missing since 1946. This year, Smith’s two daughters have dedicated an honorary brick to commemorate their father’s impressive attendance at the fair. 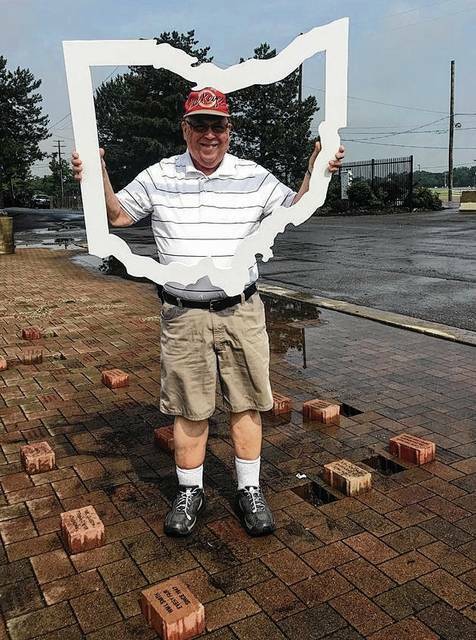 The brick was installed on June 5 near the Cardinal Gate entrance at the Ohio State Expo Center through the Ohio State Fair Brick Program. Smith noted he is eager to see the completion of his brick at the 2017 fair in late July. “I wouldn’t even consider not coming,” said Smith about the 2017 Ohio State Fair, highlighting how his yearly attendance has become a family tradition. Smith’s wife, Kathy, has attended every fair since 1955 with the exception of the year their youngest daughter was born. They celebrated their 60th wedding anniversary in April of this year. Smith, a retiree who now owns his own business, Data Doctor, has two daughters and three grandchildren. The family typically spends a full day at the fair, arriving when the gates open at 9 a.m.
“I pretty much cover it all,” said Smith about the exhibits and locations he visits each year at the fair. He finds it difficult to think of his favorite fair tradition as he has enjoyed so many throughout the last 71 years. He has been attending the fair since the age of 2, but was unable to attend from 1942 to 1945. His father was serving in World War II and the Ohio State Fair was cancelled to allow the war department to use the grounds and buildings. Smith never purposely planned on attending so many fairs consecutively. “Who ever thought that when I started going to the fair that would happen?” he asked. He is proud, he said, of the length of his dedication to the fair. Smith, his wife and their two daughters are all members of the Ohio State Fair 50 Year Club, a club for fairgoers who attended in 1967 or earlier. The family plans to attend this year’s meeting on July 31. “In our family, it just wouldn’t be summer if we didn’t go to the fair!” said Smith’s oldest daughter, Debbie Andrews. Smith hopes to attend each Ohio State Fair for the years to come. “As long as my old legs will take me, I’ll be there,” he said. The fair is July 26-Aug. 6 and includes a midway, big-name entertainment, hundreds of exhibits and one of the largest junior fair shows in the nation. Submitted by the Ohio Expo Center & State Fair.